True life confession: I am obsessed with quotes. I love them, >and I especially love writing down ridiculous and amusing things that I hear others day during my every-day life. This is evidenced in entries like this and this. I also have entire Google documents dedicated to quotes from each of my general chemistry professors, my AP psych professor, my general bio professor, my music theory professor, my amazing/ridiculous choir director from Drexel, my US History II teacher, as well as quotes from my friends. If you look at the Quotes section of my Facebook profile, it's huge. I may have a problem, haha. So you can imagine my distress at having to pick a single, favorite quote. The truth is... I can't. And so I present to you my top five quotes that I feel represent my entire collection in the best way possible. I found this on Pinterest, which is where I find a lot of quotes that I like. It spoke to me because for the last five years, my life has really been in flux. I moved to Florida, started med school, got out of a relationship, got into another (ill-advised) relationship, left med school, moved back to NJ, got my MPH, reapplied to med school, decided not to go, took a job, applied to PA school, decided that that wasn't right either, took another job, and now here I am, starting a post-bac program in a few weeks. The future doesn't look any more certain than it did five years ago, as we're starting down this road of having our future dictated by where I get into school/residency/etc. This is all really scary! 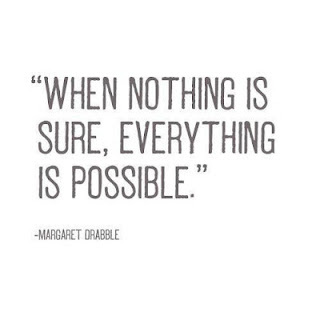 And yet the beauty is that (almost) anything is possible. It's impossible for me to get into Harvard med, so I won't be applying, but really, any number of possibilities are available to me. 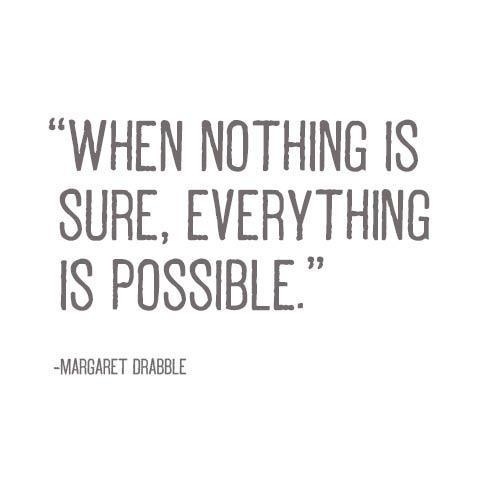 I try to focus on the happy, exciting, lovely part of that, and not the part that says, "Yes, everything is possible, which means we could all die in a fiery blaze tomorrow!" haha. So, the actual quote that I wanted to use didn't have a pretty picture to go with it, because it was said by Murray Needleman (the psychologist) to my Mom-Mom some time either before I was born or when I was really young. However, the sentiment of the quote is the same. What Murray Needleman actually said to my Mom-Mom was, "You can be afraid and you can do it anyway." As someone with an anxiety disorder, I spend a lot of my life being afraid. Fear is a healthy emotion, as it keeps us from doing stupid things like poking bears in the eye with sticks or walking in front of buses or licking poisonous creatures. However, too much of anything is generally not good, and fear is no exception. There are a lot of times in my life than I can point to and say that I didn't do something because I was too afraid, or that I didn't enjoy whatever I was doing because I was too afraid. I almost missed out on one of the most incredible experiences of my life due to fear and anxiety. In August 2011, I went to Israel for 10 days on a Birthright trip. I had never been out that far from home (the farthest I had been was Canada and Cancun, and neither of those are particularly exotic locales), and I didn't know anyone else going on the trip with me. I am not a fan of flying, and I had never taken a flight longer than 5 hours. Also, Israel is not exactly the most stable of locations on its good days, and so there were all kinds of vague and terrible situations that were floating around in my head wreaking havoc. Two days before the trip, I was under my mom's kitchen table, seriously contemplating not going on the trip. But then I heard my Mom-Mom (and Murray Needleman) in my head. "You can be afraid and you can do it anyway." So I did. That phrase became my mantra on that trip. Sleeping in the desert on a mat in an open-sided tent? Awesome. Kayaking down the Jordan River? Why the hell not? Hiking up Masada at 4 am when I know I have a bad back? Give it a shot. It was the most amazing trip that I've ever been on, and I loved every second. I think "You can be afraid and you can do it anyway," is something I say at least once a week, if not once a day. If I had a dollar for every time I've said some variation of, "She's skinnier/prettier/taller/smarter/etc than I am, " or "But everyone else in my age bracket is ", or compared my MCAT score, GPA, waist size, salary, or... anything for that matter... I could probably pay off my student loans (and that is NOT a small number, sadly). 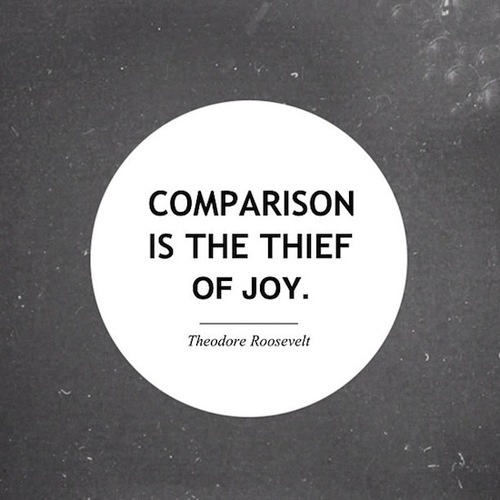 This is one of the hardest quotes for me to integrate into my daily life, but it is so completely true. I am all for evaluating what you're doing and figuring out how to improve yourself, but we get nothing done and accomplish no self-improvement when all we do is compare ourselves to other people. Aspire to be better than you are, but not because someone else is. 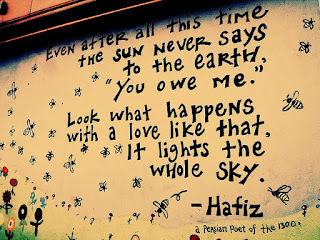 This quote featured prominently at our wedding in October, and I just think that the sentiment is so beautiful. It's romantic and it makes me happy. 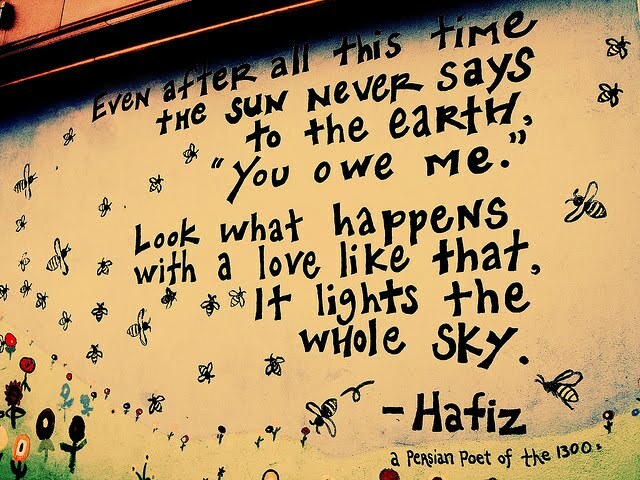 Hafiz was an Iranian poet and mystic, and his writings are just thought-provoking and lovely. I actually own this mug and it is the one that I use at work on a regular basis. Alice in Wonderland is one of my very favorite books (and Disney movies, because I am one of the 17 people who like that movie), and so I pick up Alice-related things whenever I find them. 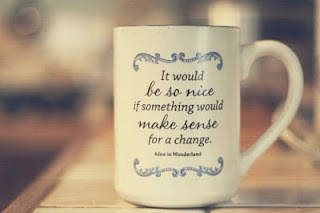 Most of the time, life is chaotic and nuts, and it would be so nice if something would make sense for a change. True story. It's just so appropriate for... everything.